Hiya guys. It's finally the weekend, woot woot! It is almost just a few days left until my birthday so it gives me something else to look forward to. 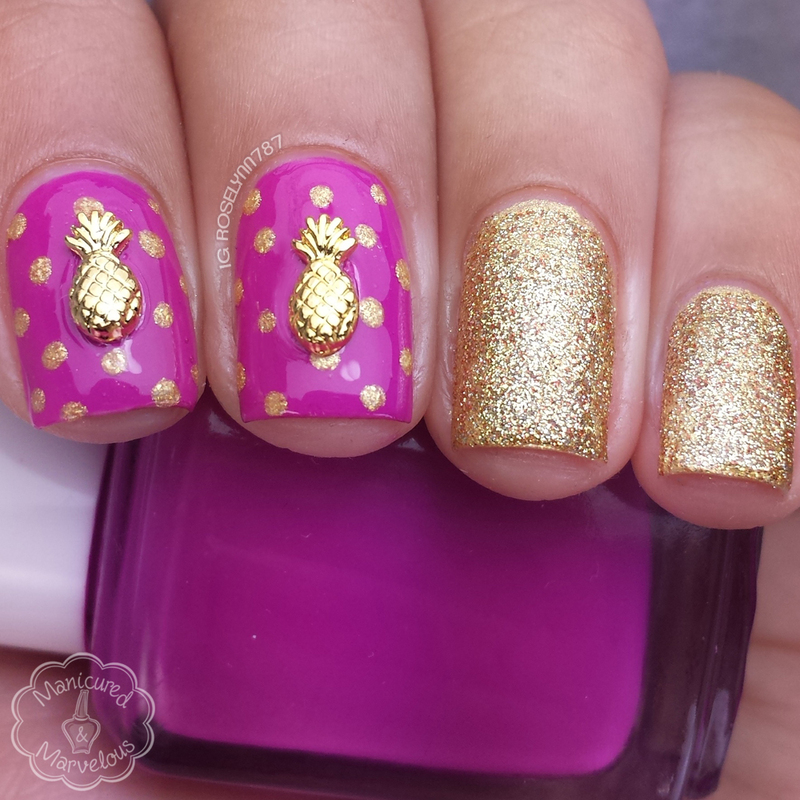 Now I don't know about you guys, but this summer I have been obsessed with pineapples. And not even for eating purposes, haha. It all started because of this photo album I picked up from Target that was fuchsia with tiny gold pineapples all over it. Then I got a roll of washi tape with gold polka dots and gold pineapples from a friend. Too cute! And that's where I actually ended up being the inspiration for this mani! Needless to say that when I saw these pineapple charms from Born Pretty Store I instantly fell in love. I definitely think it was destiny and the nail gods at work, haha. Seriously though, I absolutely love the way that this mani ended up turning out. 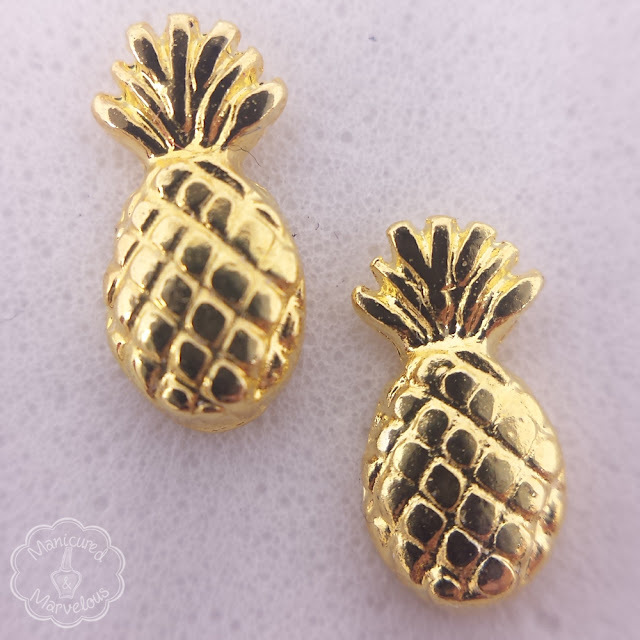 Let's talk about these pineapple charms! I was expecting them to maybe be a little larger, but I was so pleasantly surprised with the size portion on these. I know a lot of you ladies out there with shorter nail beds struggle to find charms that won't overwhelm your nails. The length and width are so ideal, definitely recommend them. Plus they are freaking adorable and very detailed for being so small. My one wish is that they would be available in a silver-tone too. I'd have pineapples for days, haha. The pineapple charm is available in the Born Pretty Store listed as Item #21075 no.62. Each pack comes with two gold-toned charms and retails for $2.62. So unless you plan on using these for an accent nail, you'll have to purchase more than one set. I could never wear the 3D, but I absolutely adore this! How cute! I'm not big on charms myself, but I love the color combination of polishes! I need to find that washi that you're talking about! THEY HAVE PINEAPPLE CHARMS?! Oh my god, I neeeed these in my life!!! I love anything pineapple, too, so I adore this! 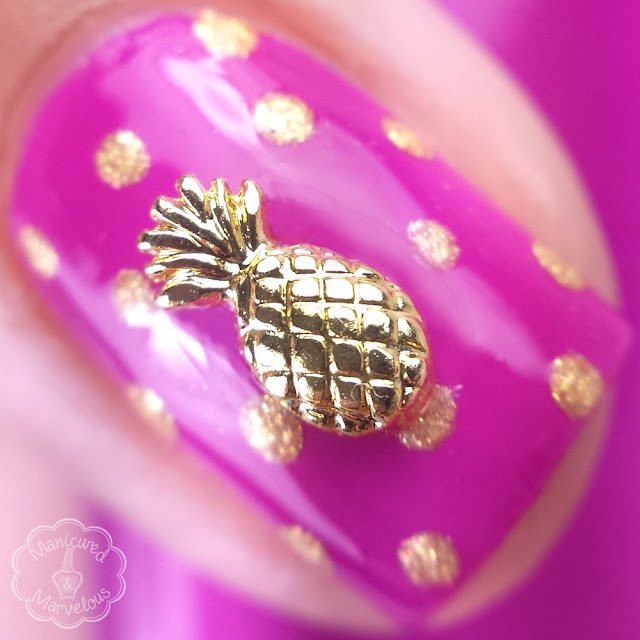 I freaking *ADORE* this manicure - I've been obsessed with pineapple stuff this summer as well - I just hadn't found a way to incorporate it into a mani yet! BUT now you've inspired me! These are so cute!! I've never worn charms like this before, but these look like really nice! These are so cute and the design looks fab! I keep seeing these pineapple charms! 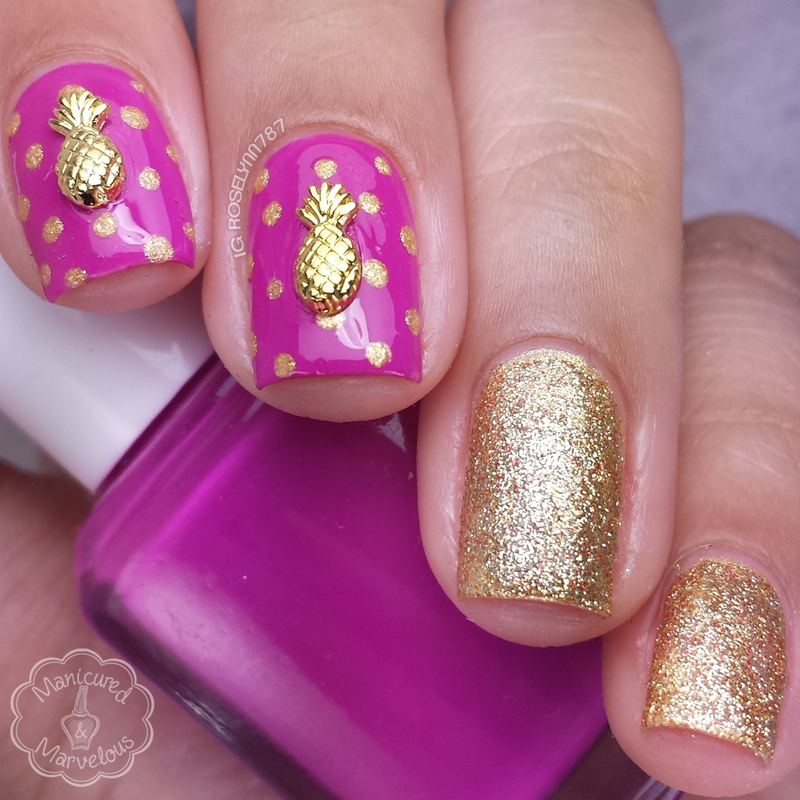 I am obsessed with all things pineapple right now - Need these! This so so CUTE! Oh man, I just love how bright and peppy this is- your nails look so fancy/designy! Those charms are adorable and this mani is super cute!